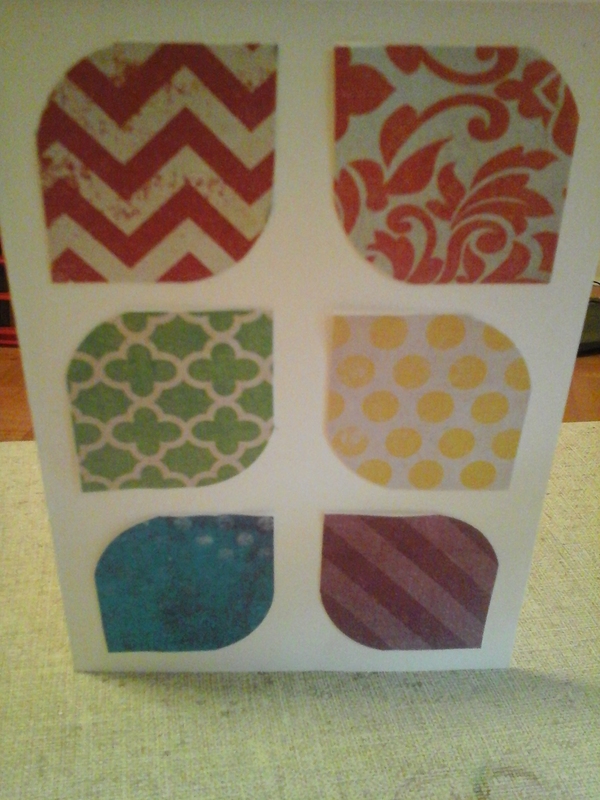 I cut 1.5″ squares and then used a corner rounder punch to round 2 corners. I didn’t put all the shapes the same direction, rather kept the ones on the left facing one way and the ones on the right facing the opposite way. Because the colorful paper was just paper, not card stock, I glued (using glue stick) it to plain white card stock (I had plenty of that) to keep it sturdy and also make it pop out from the card just a little. Gluing it to card stock after cutting the square made things much easier when I punched it through the corner rounder! Trust me – I tried both ways, the paper alone didn’t want to punch. I used the liquid glue to glue the card stock/paper combo to the card paper. I made a rainbow design just for fun. You could use coordinating colors or black and white – I might try those later! Saw the above on Pinterest, giving me the idea to use a corner rounder on squares. Thanks for the inspiration! This entry was posted in Cards, DIY, How-To and tagged anniversary, anything card, birthday cards, blank card, card, cards, every day card, rainbow. Bookmark the permalink.